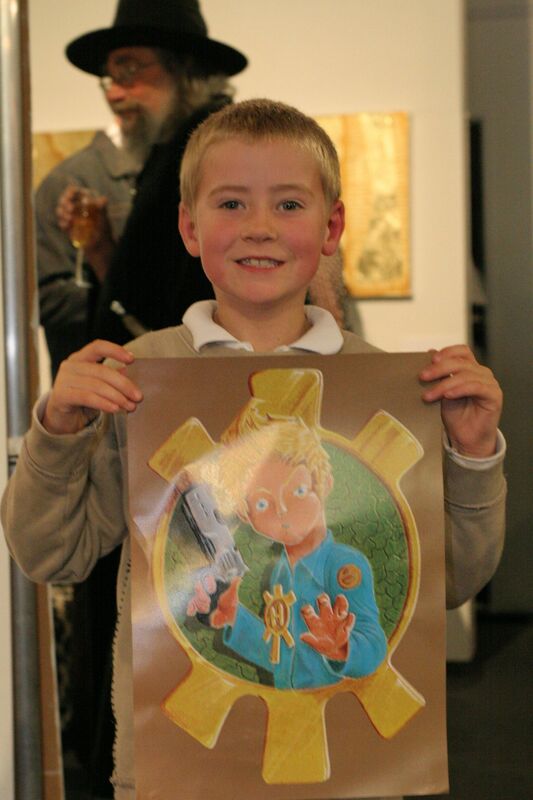 I had the most fantastic night at the launch of Deputy Dan in Christchurch last night. Various friends joined Joel and I for a tram decoration party ahead of the procession – my mother had cut giant pictures of Dan out, and these went around the outside of the trams, while lots of pages from the books went up inside the tram cars. Our magic balloon team hung up blue and gold balloons. Place mats that looked like the book cover were put at all the dinner place settings in the restaurant car and the Sunshine band boarded the other tram! Then we climbed aboard and rode the decorated trams to the tram stop in Cathedral square, waving madly to all our guests waiting for the pre-launch celebration as we pulled in! What a way to make an entrance! As we pulled in Joel saw that Mr Winston Pratt, the personable owner of the Hog and Whistle Pub, had come for the party. I don’t think I’ll ever forget how excited Joel was to see someone he had spent so much time drawing again! The tram ride was an absolute hoot. Fantastic food was served all round and great conversations shared with many friends. The Wizard was in fine form and the awesome girls of Splatt 96.1 FM roved the trams chatting with people live on air. The Sunshine band shone, Mr. Pratt sang along to their groovy tunes, Cobra (photographer extraordinaire) roamed the trams firing off photographs and jokes with equal verve, and everyone seemed to have an absolutely marvellous time. I loved every second of it! There was something incredibly special about the glow of the old wood and brass trams, dimly lit, and the wonderful people around me. We passed the circle of people lighting candles for those who died in the earthquake in China several times and the solemnity of their ever growing group was quite powerful. I could see that my review team (the delicately elegant Charlotte Corkery, debonair Luke Van Der Meys, and dashing Tyler Lomax – writers on the prowl) had a truly good time as they all had huge grins and brandished shiny balloons. It seemed like everybody getting off the trams at the end of the trip couldn’t stop smiling and, for myself, from the start of the tram rides I didn’t cease grinning all night. We trooped from the tram stop at Cathedral Junction to the Design and Art College New Zealand where the Sunshine Band resumed playing, the great folk from Warners Historic Hotel had set up a cash bar and were serving champagne, and there were tables piled with no less than 700 exquisite Sweet Kitchen cakes. The latter disappeared with surprising speed as people realised just how delicious the Valrhona chocolate mousse cups, lemon meringue tartlets, white chocolate and passionfruit creme discs and cupcakes were. After a half hour or so of welcoming all the guests pouring in The Wizard of Christchurch blew upon a horn to get everyone’s attention and the ceremonial part of the book launch commenced! I really enjoyed speaking to all the people who came to celebrate the launch of Deputy Dan & the Mysterious Midnight Marauder. Everyone was warm and receptive, we had some laughs, and even the parts of my speech I improvised went well! *phew! * Then I read a verse of the book to lead in to an excerpt being delivered in New Zealand Sign Language by Mark Berry, a talented student from the Van Asch Deaf Education Centre, with the assistance of Heather Benbow and Jane Peterson. I think everybody was fascinated by his performance and just how expressive sign language is. Several people commented that Mark could have an amazing career ahead as an actor if he wanted to. Later, Mark quietly gave me a brooch in the form of a butterfly to represent the deaf – a mostly silent but beautiful part of the community. This token I was told is traditionally presented to friends of the deaf. It was an incredibly touching and special moment for me. I will treasure that brooch always. Finally, the Wizard closed the formalities with a blessing for the book, that incorporated some amazing deep chants and ritual gestures as he cast the magic spell! Joel and I were kept very busy after that signing books for people. Many guests read the book while they waited to reach us and then arrived beaming! As people waited in line my mum roamed up and down with trays of tiny cakes for them so they didn’t miss out. Then, there was lots and lots of socialising with the night wrapping up at a post-launch surprise party held in honour of Joel and hosted by the lovely people at Warners. They had made vouchers with Joel’s likeness on them entitling any person who bought a drink at the launches cash bar (which benefited Duffy’s Books in Homes) to a free drink at the Warners gathering afterward. They were very generous! A huge thanks for an awesome night to The Design & Art College of New Zealand, Warners, Cobra the Photographer, Rainbow Print, Villa Maria Wines, Sweet Kitchen, The Wizard of Christchurch. Ginger Meggs for their help dressing Mr. Pratt and with my hair, and the Sunshine Band. A second huge thanks to everybuddy who came to help us celebrate the completion and release of Deputy Dan & the Mysterious Midnight Marauder! Thanks to Cobra for his brillant photographic efforts. Please note these pages are image heavy and may take time to load. Just click the pictures to get larger images.